This small town on the Polish-Czech border has a greater mix of different cultures than anywhere else in Poland. 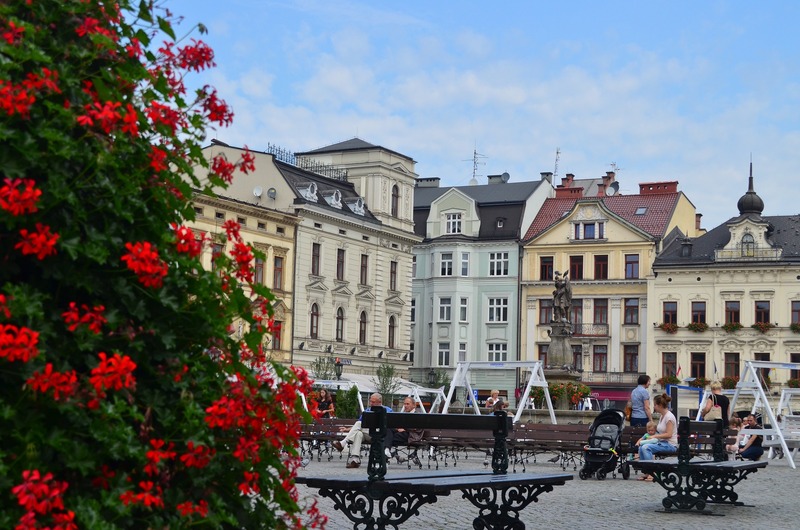 Silesian Cieszyn, Bohemia, Moravia, Austria, Hungary and Germany have all been closely connected with the town at some point in its history, and this long past is as both complicated and fascinating as the rich history of Silesia and the Duchy of Cieszyn. 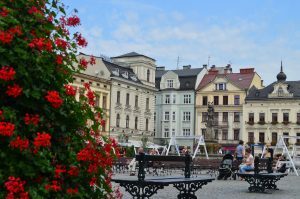 Divided into two parts – Polish and Czech – today’s Cieszyn can be proud of its beautiful “little Vienna” Old Town with its atmosphere of Prague, its Summer Film Festival, the ever popular “Prince Polo” chocolate wafer bars, and its own flower – the cieszynianka. When you visit this delightful place you will believe that time must have forgotten all about it. Almost every detail here tells you something of the story of ten centuries of changes that have happened since the three brothers, Bolko, Leszko and Cieszko, arrived here in 810, discovered a spring and decided to settle here on the Olza River. They called the place Cieszyn from the Polish phrase “cieszym się” which means “we’re happy”. There is a well at the Three Brothers Street as a token of remembrance, but this is not the only place in the town to remind us of the past. Even Gleboka Street, which is the main shopping street of the town, was established at the end of the 15th century. On each step of our walk along the streets in Cieszyn we can see historical buildings – the Romanesque Nicholas’ Chapel and rotunda on the Castle Hill, the Gothic St. Mary Magdalene’s Church, the Castle tower bourgeoisie houses, the Town Hall and Castle Brewery and many other places marked by different cultures – the Austrian-like Old Town, the old and new Jewish cemeteries, the German House, and the protestant Church of Jesus. Last but not least is the Museum of Cieszyn Silesia, the first museum in Poland and located in the former Larish family palace. If you are hoping to relax in the open air, Cieszyn can offer you a wide range of activities. There are several trails waiting for you in the Kopce (The Mounds) reserve and Municipal Woods on the Puncowka reserve, the former being situated at the north-western end of the Cieszyn foothills. The landscape is currently dominated by arable fields and a number of small forested areas. The banks of the Olza River (only 16 km on Polish side) are also worth a stroll along. No matter what the season, Cieszyn is the right place to visit because of the many cultural events taking place there every year. For film and theatre fans we recommend the Festival of Czech and Slovak films “Cinema on the Border” (April), and the International Theatre Festival “Without Borders” (May). There are also plenty of musical events, including the “Viva il Canto” Vocal Music Festival (August), a Decade of Organ, Choir and Chamber Music (October), and the Cieszyn Jazz Festival (November). Sports enthusiast will enjoy the Cieszyn Alpine Skiing Cup (January), the International Cieszyn Tennis Championships (June) and the many other events held here. Cieszyn, one of the oldest towns in Poland, is situated in the Silesian Voivodship on the Olza River, opposite Český Těšín. The town was divided into two parts, with the left-bank being part of the Czech Republic and known as Český Těšín. Together the towns constitute an important transit centre on the Czech-Polish border, close to the territory of Slovakia, and form the capital of the Cieszyn Silesia Euroregion. The town came into being in the 10th century as a stronghold built to defend Poland’s southern borders. From around 1290 Cieszyn was the capital of the autonomous Duchy of Cieszyn, a region that later became Cieszyn Silesia. In the 16th century the town was one of the most important centres of trade and commerce, and also a centre of the Reformation movement. After the World War I, Czechoslovakia attacked the Polish part of the region and forced Poland to withdraw from the greater part of the Zaolzie area. Poland recognised the new borders running along the Olza River in 1920; Czechoslovakia got the western section and a part of the Duchy capital known as Český Těšín while Poland got the eastern section of Cieszyn. During World War II Germany annexed the city and renamed it Teschen, and the borders of 1920 were not restored until 1945.